Macumbeira: MM Part 7: Fullness of Harmony. MM Part 7: Fullness of Harmony. In his diary entry of february 10, 1920, Mann describes his own sessions with a new electric Gramophone at a friend's country house in Feldafing to which he withdrew in order to work on his novel. 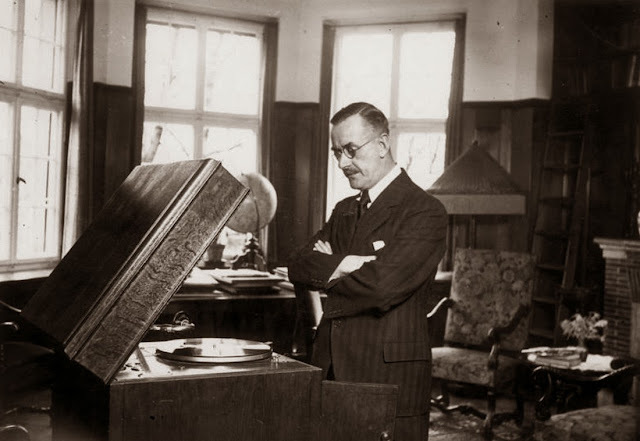 "The highlight of the visit : Richter's superlative Gramophone , which I put to continuous use, either alone or with Katia and Richter. The Tannhäuser Ouverture, la Bohème. The finale of Aida ( an Italian Libestod ) Carusso, Battistini, Madame Melba, Titta Ruffo etc. A new theme for The Magic Mountain, a rich find both for it's intellectual possibilities and it's narrative value." Love for music fills the emotional gap which Clavdia has left. Hans listening to the music “filling time” should be therapeutic. The different operas, ballet themes and songs are carefully chosen by the narrator. They create a spark of an emotional memory in Hans and the reader and as such are a perfect resume of the story to which end we are coming. It is brilliantly done…. Is that Settembrini we hear ? – eh il barbiere. ( eh inginere ) Di Qualita, di Qualita! She has no eyes for the younger Alfredo who declares her his love (Un di, felice, eterea – the day I met you )…in spite of the fact that she is with another older man. Hans takes over the manipulation of the machine as soon as Behrens leaves. 4. The Barcarole from the “Les contes d’Hoffman” by Offenbach. HC has discovered a new passion, a new Love. He spends time with the machine till late at night, then from early in the morning. Hans appoints himself as caretaker of the musical cabinet and even takes the key. Hans has favorite discs. The narrator lists them for us…All of them conclude with a reunion of Love in Death. Radames cannot forsake his love for the Barbarian girl Aida. Which was this world of forbidden love behind this enchanting song ?